Tagged Food For Every Mood, Alida’s second recipe book, Cook From The Heart is quite different from her first recipe book. In this recipe book Alida has provided us with recipes to suit every mood and the chapters are divided into happy, melancholy, celebrate, nostalgia, tranquil, anger, love and lazy. Before I get into the recipe book I want to state that I do not like the layout at all. However, I do like that each recipe has its own story. It makes the recipe book more personal and it is a great way to get to know Alida a little bit better. But the layout is detracting for my exacting eye and I wonder if this is a new look Penguin are going for? That aside, the photographs are stunning and accompany each recipe. From the happy chapter I will soon be trying the passion fruit lemonade (page 11) as it sounds absolutely refreshing. I just had to try the ultimate oven fried chips (page 25) and I made them for dinner last Saturday night. 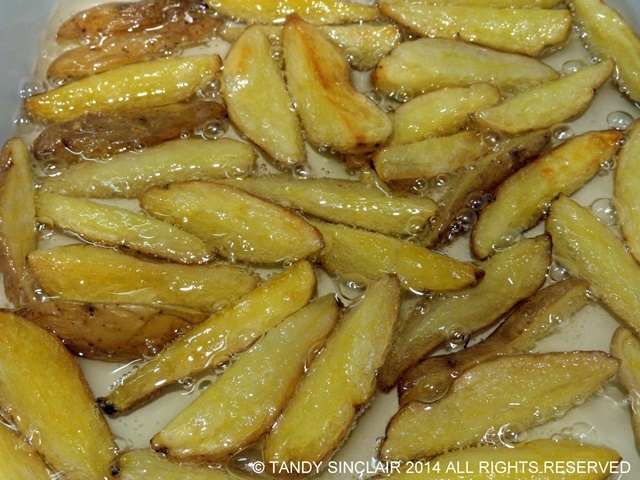 I love that I did not have to deep fry the chips but I was not sure how hot to make the oil. I suspect I did not get it hot enough and if you look closely at the photograph you can see bubbles. I would suggest you get the oil bubbling hot before putting the chips in. I also chose not to peel the potatoes as I was using small fir potatoes, but it is worth peeling them as Alida recommends. Alida shares that the easiest chapter to write was the one providing recipes for melancholy moments. Food without a doubt is the ultimate comforter. I agree with Alida that roast chicken (page 38) is comfort food and it would be my wish for my least meal, if I ever get that blessing. 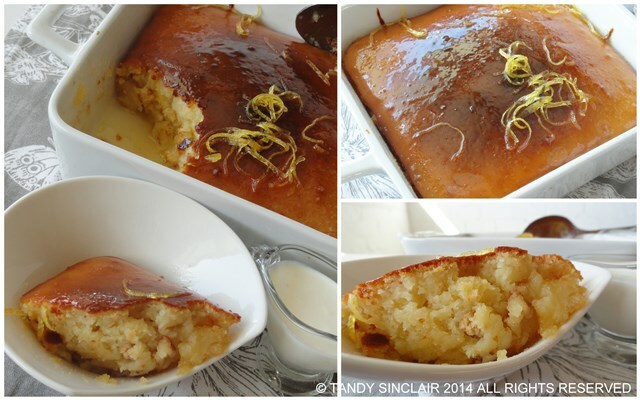 I chose to make the lemon syrup pudding (page 62) as my tester recipe for the book and it was stunning. Who can resist beef wellington with truffled porcini gravy (page 69) which appears in the chapter celebrate? Alida makes use of champagne and prosciutto in this section and her favourite recipe is the one for gnocchi with Gorgonzola cream (page 77). It is the nostalgic chapter that is true to everyone’s heart as these are the recipes passed down from generation to generation. Classics like avocado ritz (page 98) and crêpes Suzette (page 100) find a rightful home here but it is her kêrrie en rys (curry and rice) (page 106) that will have any South African nodding their heads with the mention of Mrs Balls Chutney. I am so going to try the Asian noodle slaw (page 125) as I love the flavours. This recipe features in the chapter titled tranquil together with coconut curry mussels (page 131) and home-made ricotta cheese (page 141). I am adding this to my long to do list! It is the chapter on anger that finds no resonance with me as I do not cook when I am angry. It always results in disaster and on the rare occasion I am that angry, it is best we go out for dinner. In this chapter, Alida shares recipes for jalapeño poppers (page 168) which Dave has been making (hopefully out of love) for the past few months. We skip the crumbing stage and just do them straight on the braai (barbecue). I suppose the best expression of anger would be cooking me a dish of lamb vindaloo (page 170) as I can barely handle a mild curry dish. I am not sure why Alida’s ultimate award-winning chocolate peanut butter cake (page 174) is in this chapter, as it would make me quite happy to enjoy a slice. My true expression of love is making hollandaise sauce to go with eggs Benedict (page 203) and Alida has her recipe in the chapter titled love. Next time we have oysters I am going to try the 3 toppings (page 207) Alida uses as it is nice to experiment with different flavours on an ingredient I adore. Another of Alida’s favourite dishes appears in the lazy section and is for cheese stuffed arancini (page 222). These balls of delight are something I can make over and over again and enjoy with delight. The book contains a wealth of really good recipes and I can recommend that you find yourself a copy to enjoy, no matter your mood. Such an interesting way to categorize the recipes…and they sure sound yum! Omg! Truffled porcini gravy!!! Yum! Although the layout sounds a little odd the food sounds amazing! Tandy, I love that you’re not one of those bloggers who writes a positive review for products no matter what they’re like. This type of honesty is refreshing! And I would love to try those jalapeño poppers, yummy! 🙂 Great review! Thank you so much for the compliment Melanie! I like cookbooks with personal stories very much. They always draw me in. 🙂 The beef wellington with truffled porcini gravy sounds amazing!! what an interesting idea – food for moods. I know what comfort foods I like (Indian dals) and happy food, well that could be anytime! I’m wondering what your foodie mood meals would be?! How interesting Tandy. I have never seen a recipe book chapters labeled by emotions. I do not cook when I am angry as well, but I do when I have things to sort out, because it relaxes me. What interesting recipe ideas! And I’m quite intrigued by the way that are chips are cooked too. This sounds like a great cookbook! Sounds like a great cookbook full of such a wide variety of recipes!! Mmm, it sounds like this book is the ultimate in lots of cooking, it is such a range of deliciousness! The recipes sounds heavenly Tandy. Pity though the layout isn’t too nice though.